Forestry Mod will add to your game a huge number of innovations, including the new blocks, items and mobs ore, as well as allow you to create automated farm to harvest! Forestry Mod - it's pretty much a modification that will allow you to add many new Minecraft blocks and items that are largely diversify your game. In addition, after installing Forestry Mod game world will be transformed and you will notice how near you start flying butterflies and bees, there will be new types of trees, and in the mountains and caves you can find new ore. 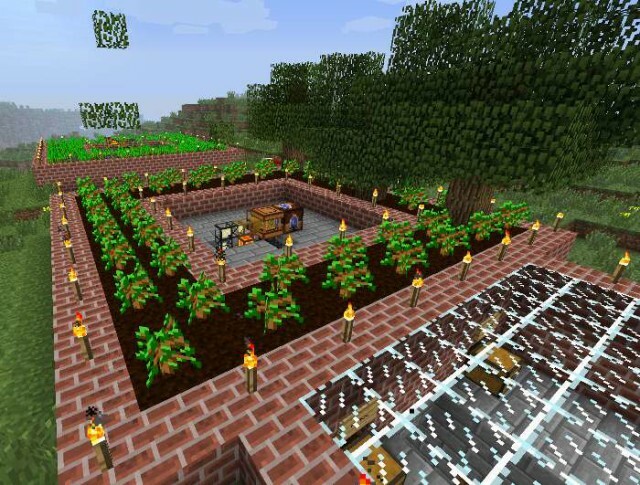 But the main feature of mod Forestry Mod for Minecraft 1.7.10 is that once it is installed you will be able to create automated farm to collect a wide variety of resources. For example, you can create a custom field with wheat, a crop which will be collected in an automatic mode, and after collecting the land is sown new seeds. Also, Forestry Mod adds a possibility to create their own apiaries and bee breeding. Just imagine your future cabin in the woods, where you collect honey in the morning, and the remaining resources come to you automatically, and at this time you can do other things! But remember that before you go to the apiary, you better wear a special suit beekeeper to protect themselves from the bees. In addition, the Forestry Mod there are dozens of new items for your home, for example, you can create a mailbox to which your friends can put the letters and messages, and you have to check their email. Forestry Mod perfectly compatible with such popular mods like IndustrialCraft and BuildCraft, so you can even more diversify your game!